Pest Control You Can Count On! A full service Termite & Pest Control company offering pest prevention and treatment services for Florida’s Treasure Coast and South Florida areas and termite pre-treat services in the entire state. 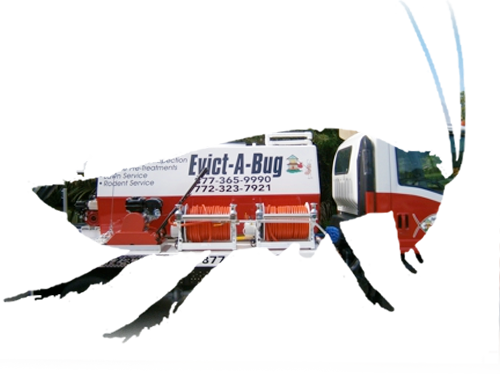 Evict-A-Bug Termite & Pest Control, Inc is your trusted full-service pest control company serving Indian River, St. Lucie, Martin, and Palm Beach Counties and termite pre-treat services for the entire State. We guarantee you only quality and dependable service because you deserve nothing less, and your satisfaction is our top priority. So if it’s professional and efficient pest control you’re looking for, the name to remember is Evict-A-Bug Termite & Pest Control, Inc. Protect your biggest investment by having your home inspected by one of our termite prevention specialists. We’ll ensure your home is on guard and develop a pre-treatment strategy to protect your home for years to come! Don’t let pest disrupt your living space or intrude on your day-to-day activities. Pests can be a real problem, but there’s an easy solution! We have the tools and experience to make sure those pests are gone for good! Rats and mice are not only a nuisance but can also cause property damage and transmit diseases. A successful rodent control program includes a combination of baiting and trapping for the highest rate of success.